Your design or out design, at The Palace Printer you can have your flyers printed quickly and professionally. 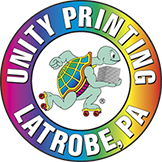 We have a multitude of color papers or with our new Canon Full Color printer we can print your copies in vibrate full color at 50 copies per minute. Stop in and see us.